This post is the third in a series that will provide an analysis of the various hotel reward programs. The analysis of the reward programs will include information on the participating hotel chains, ease of earning points, point redemption options and costs, program tiers, and, finally, an overall evaluation of the program. As more programs are reviewed a side-by-side comparison of the programs will be provided along with the program’s Martini score, our unique valuation for reward programs that will allow you to effective compare programs. The Hilton hotel chain is comprised of 3,300 hotels in 77 countries worldwide. The Hilton brands: Hilton® (over 500 properties), Conrad® (18), Doubletree® (180), Embassy Suites® (~200), Hampton Inn® and Hampton Inn & Suites® (1400+), Hilton Garden Inn® (350), Hilton Grand Vacations Club® (34), Homewood Suites by Hilton® (275), and Waldorf Astoria Collection® (5). Hilton® hotels and resorts have set hospitality standards worldwide by hosting dignitaries, celebrities and everyday travelers in style for more than 80 years. From the lavish The Waldorf Astoria® to the exotic Caribe Hilton, there’s a Hilton that’s perfect for you. With award-winning luxury hotels strategically located in capital cities and exotic resorts around the world, Conrad® Hotels offer outstanding service for both business and leisure travelers. Enjoy the finest accommodations, excellent restaurants, fully equipped health clubs and sophisticated conference and meeting facilities. With a growing collection of contemporary, upscale accommodations in more than 150 locations throughout the U.S., Canada and Latin America, Doubletree has reinvigorated today’s hotel experience by providing today’s business and leisure travelers with more of the true comforts they enjoy at home. Whether you’re traveling for business, a family vacation, or just to get away for a few days, our spacious two-room suites and lobby atriums offer you plenty of room to stretch out and relax. Wake up to our complimentary full cooked-to-order breakfast and wind down with our nightly Manager’s Reception featuring your favorite beverages. With almost 1,300 locations throughout the U.S., Canada, Mexico and Latin America, Hampton® hotels offer guests guaranteed high-quality accommodations, friendly service, and clean and comfortable surroundings for a great value. Plus, guests will enjoy complimentary high-speed Internet access in-room and wireless in all public areas, our On the House® hot breakfast, On the Run Breakfast Bags™, local calls at no charge and lots more. At Hilton Garden Inn® hotels, you’ll find everything you need to be self-sufficient on the road. Each guest room offers a hospitality center with a refrigerator, microwave and coffee maker, plus complimentary high-speed Internet access, two telephones with voicemail and dataport and secure remote printing to the 24-hour complimentary business center. Spacious, condominium-style accommodations are complete with fully equipped kitchens, separate living and dining areas, and feature studio, one-, two- and three-bedroom configurations. Designed as vacation ownership resorts, each Club offers extensive amenities which set the stage for grand vacations and great getaways. Stay for leisure or business travel…or join our exclusive membership Club and own your accommodations for a lifetime. Homewood Suites by Hilton® allows you to feel closer to home whether you’re traveling for a few nights or longer. Every spacious studio, one- and/or two-bedroom suite features enough space for work, relaxation or entertaining, plus all the comforts of home, including a fully equipped kitchen, a remote controlled television, two telephones with voice-mail and complimentary high-speed Internet access at all U.S. locations. You’ll also enjoy a daily complimentary Suite Start™ hot breakfast and a Welcome Home® reception with a light meal and beverages every Monday-Thursday (subject to state and local laws). All for less than you might think. The Waldorf Astoria Collection® offers all the amenities and services that guests should expect at some of the most extraordinary properties in the world. Located in desirable travel destinations, each hotel has its own individual character, timeless architecture and special history. Hotels and resorts in the collection include the legendary Waldorf Astoria® in New York City, Arizona Biltmore Resort & Spa in Phoenix, Grand Wailea Resort Hotel & Spa in Maui, La Quinta Resort & Club in La Quinta, California and Qasr Al Sharq in Jeddah, Saudi Arabia. Hilton’s HHonors program is unique in that it offers customizable earning options and numerous opportunities to pile on the points. The key difference between this program and other hotel reward programs is that you are able to earn both points and airline miles, Double Dipping®, for each stay. Blue – Basic level of service. Silver – Earned after 4 stays or 10 nights. Silver earns a 15% point bonus. Gold – Earned after 16 stays, 36 nights, or 60,000 base points. Gold earns a 25% point bonus, an option to collect 1,000 points per stay, and complimentary high-speed internet access. Diamond – Earned after 28 stays, 60 nights, or 100,000 base points. Diamond earns a 50% point bonus, an option to collect 1,000 points per stay, a space available room upgrade, breakfast, and complimentary high-speed internet access. The membership program is based on a calendar year. In addition to earning points for hotel stays, points can be earned with rental cars. Rentals at Alamo, Avis, Budget, Europcar, National, and Thrifty earn 250 HHonors points. Some of these offers are require a hotel stay at the time of the rental so check Hilton’s site for restrictions. Sixt Car Rental offers 500 points per rental and is not dependent on a Hilton stay. While earning points is reason enough to rent with these companies, there are also discounts and upgrades available to HHonors members. Avis – Avis provides a 25% discount for your rental. Enter Avis Worldwide Discount (AWD) number K851000. Budget – Budget offers HHonors members up to 20% off each time you rent. Simply provide your Budget Customer Discount (BCD) number U106100 when making your reservation. Europcar – All Hilton HHonors members benefit from special rates throughout the year when renting with Europcar, including a 5% discount for Blue members and a 10% discount for all VIP members. Plus, HHonors Diamond VIP members are entitled to an upgrade free of charge when using preferential rates! Quote the appropriate promotion code at reservation time: Blue – 42194435; Silver and Gold – 42194481; Diamond VIP – 42194502. HHonors points can also be earned with Visa and American Express credit cards as stated in posts earlier this month. A substantial amount of points can be earned with these cards so do not miss out on this opportunity. There are other earning options that are not nearly as significant as hotel stays, car rentals, and credit card usage. Future posts will provide additional details on these opportunities. You can stretch your points for great reward savings at participating Point Stretcher hotels worldwide. 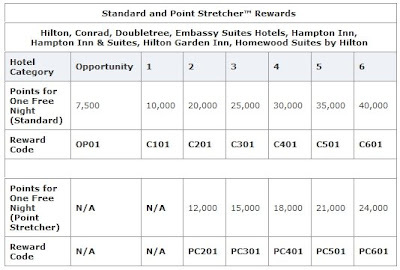 Point Stretcher hotel rewards let you stay for 40% fewer points than the amount of points required for Standard Hotel Rewards at participating Point Stretcher hotels worldwide. The only problem with the Point Stetcher program is that there only a select number hotels taking part in the program. Since the majority of hotels are not participating you can expect to pay full (point) price a majority of the time. Cars can be rented with Hilton’s U.S. car rental partners from 14,000 to 18,000 HHonors points per weekday. Week-long rentals will require 70,000 to 75,000 depending on the rental car company. More luxurious options for redeeming points can be found on Hilton’s website. Some of these options include the use of points to purchase unique experiences such as tours of New York or Beijing, motorcycle rentals, ski passes, Caribbean destination packages, gift certificates for cruises, and Disneyland and Walt Disney World. Future posts will discuss each of these options in more detail. Although I have stayed at Hilton hotels in the past I have not included Hilton in my normal hotel rotation. That may change after taking some time to analyze the HHonors rewards program. The hotel chain has a wide range of hotels and the hotels are present in many cities in the U.S. and around the world. The costs for redemption seems high but the rate of earning is high as well. My interest has definitely been piqued by the numerous redemption options available. As I delve further into these redemption options and the HHonors program I will let you know if they are worth the pursuit. As it is, Hilton should be a consideration for your hotel dollars.